CAMBRIDGE, UK, Dec 15, 2016 – Granta Design announced GRANTA MI Version 10, the latest version of its leading materials information management software, delivering a new workflow system plus new and updated apps and tools based on experience and feedback from implementations worldwide. Version 10 offers engineering enterprises complete control over how they collect and apply materials knowledge and removes major barriers to digitalizing materials-related processes. It will be demonstrated at a Web seminar on December 15. GRANTA MI:Workflow has a simple user interface of forms and task-based activities to enable key workflows. This example shows a material lab manager’s task list. Business processes have become highly-digitalized over the last 30 years. But the world of engineering materials has lagged behind. Constraints have included manual and error-prone processes, the widely-varying needs of different groups in an enterprise, and the lack of a consistent approach across key engineering tools such as CAD, CAE, and product lifecycle management (PLM) systems. Version 10 removes these barriers. It ensures that materials information is captured digitally and linked intelligently, establishing a single, consistent, traceable ‘gold source’ of materials data for the organization. Central to this is the new GRANTA MI:Workflow, which enables companies to manage the processes by which materials information is requested, collected, approved, and released in a controlled, traceable manner. Its simple user interface of forms and task-based activities enables workflows such as to-do lists, email notifications, approval sequences, and moderation queues. A key feature is the audit trail of who performed which step of the process, and when. 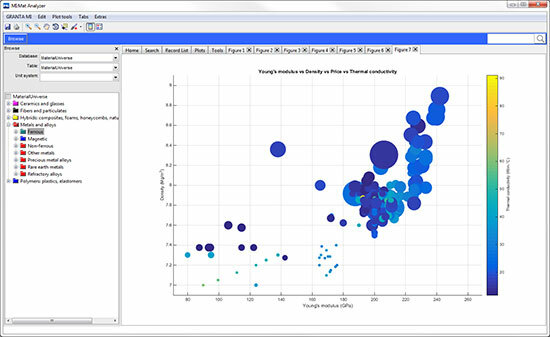 Gain greater understanding and insight into data relationships with MI:Mat Analyzer, a new app to enable advanced plotting and graphical analysis. Granta’s apps find and apply the right data, quickly – and fully traceable to its source. MI:Explore, which enables configuration of task-specific apps, has expanded support for accessing CAE material models, with more intuitive searching, visualization of curves such as stress-strain models, and one-click generation of correctly formatted material cards. 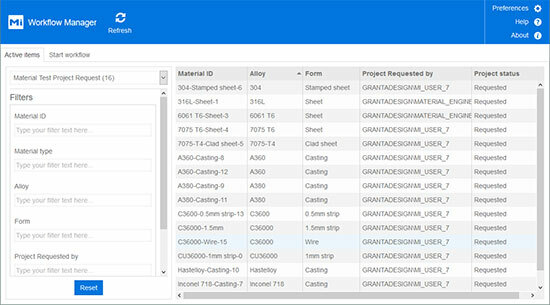 The latest MI:Materials Gateway is substantially faster; users across CAD, CAE and PLM can use this embedded app to search and browse materials and assign them to parts and models, quickly and easily. GRANTA MI customers will also gain greater understanding and insight into data relationships with the new MI:Mat Analyzer, an app for graphical exploration of data. Its plotting options help organizations unlock insights into how material properties vary with process parameters, for example. The cleaner, more intuitive MI:Viewer user interface makes it easier to browse, query, edit, and use data. New Application Activity reporting enables analysis of usage trends: e.g., which data is most popular, or how many users accessed the system; create performance indicators for management or compliance reports. New projects can get up-and-running quickly by applying best practice data management templates, developed in collaboration with the world-leading enterprises that use GRANTA MI. Apply the data structures of the MI:Additive Manufacturing template to capture AM property and process data; now you can apply graphical tools to understand the vital relationships between materials, properties, and process parameters. Another template now enables the capture of test or simulation data relating to joined material combinations (welding, riveting, adhesive bonding, or other process). Results from common tests can be collected with a clear understanding of the joining process and geometry used to generate the test samples. The installation process has been streamlined, and signing in to the new My Granta account enables easier download of new software and upgraded databases. My Granta also provides new support resources, including a library of video recordings of regular online GRANTA MI training sessions. Founded in 1994 as a spin-out from the University of Cambridge, Granta helps hundreds of engineering enterprises to manage information on the materials (metals, plastics, composites, and more) that are essential to their businesses. For more information, visit http://www.grantadesign.com/.